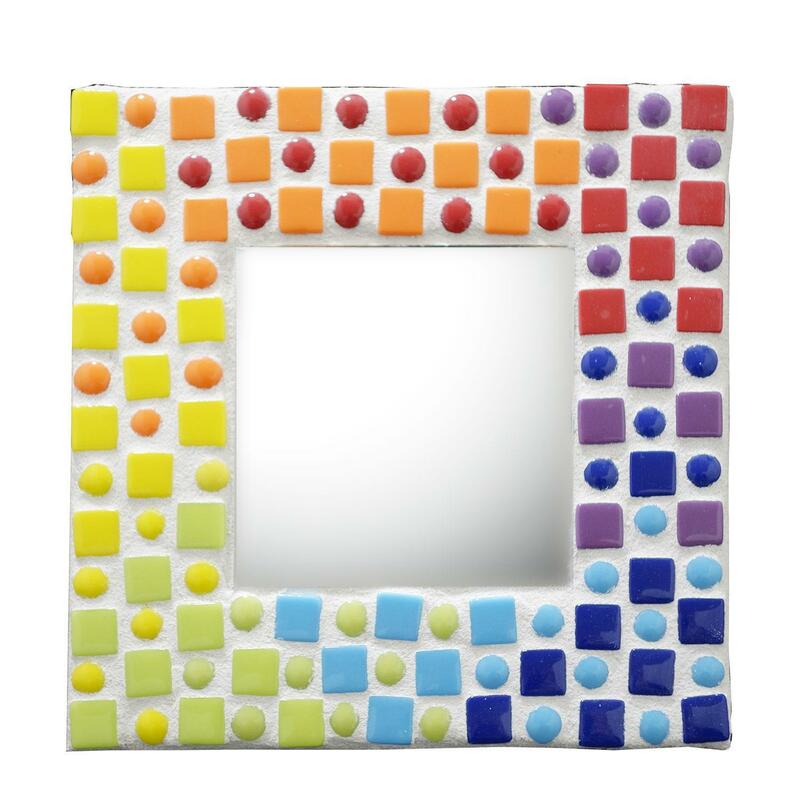 Create a unique mosaic mirror full of cascading colors! Cover your work area with newspaper or kraft paper. Place the MDF square on a piece of scrap paper. Trace around it to create a template. Using a ruler, measure and mark the center of the template. Center the mirror on the middle mark. Install hanging hardware before adhering mosaic. Sort out each color. Starting beside the mirror, place tiles using image as a guide. First place the squares in a checkered pattern. Align the tiles in the order of the rainbow – red, orange, yellow, green, blue, indigo and purple. When the template is full with squares, place the dots in the empty spaces, use the proceeding color to fill each space; red dots next to the purple squares, orange dots next to the red squares, yellow dots next to the orange squares and so on. Be sure to leave 1/8” between pieces. When you are satisfied with your design, carefully remove the mirror and glue it to the center of the base. Place tape or contact paper over the mirror to protect it. Next, glue each piece onto the base. Allow glue to dry according to manufacturer’s instructions before moving on to the next step. Mix about 3-4 tablespoons of water with 1 cup grout in a disposable cup or bowl and mix thoroughly to achieve the consistency of peanut butter. If needed, add more water a teaspoon at a time. Wearing a glove, spread the grout over the tile, filling in all of the crevices. Wait 5-10 minutes and wipe away the haze with a damp paper towel. Allow grout to dry overnight, buff tile with a soft cloth.